The Wedding ceremony will start at around 10a.m. Sunday in May 3rd, 2009. 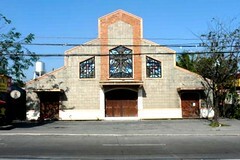 The Church is located along Zapote-Alabang Road, Molino 3, Bacoor Cavite. The wedding reception will be held in this beautiful summer getaway resort. Programme starts at 12nn in the resorts private pool garden after the wedding ceremony. Located in Green Valley, Magdiwang Road, Barangay Mambog, Molino II, Bacoor, Cavite. Please click photo above for larger view.